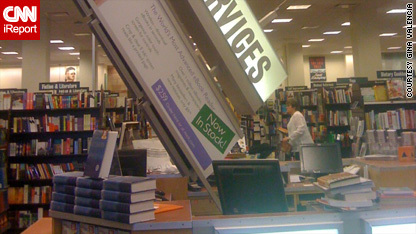 A sign came loose from the ceiling of a Barnes & Noble bookstore in Palm Desert, California, following the 7.2-magnitude quake. [Updated at 10:48 p.m.] The quake was the largest in the Baja California and Southern California area since 1992, the USGS reported. The '92 quake, which struck in Landers, California, triggered an earthquake the next day in Nevada and another quake 11 days later in Southern California, according to USGS seismologist Lucy Jones. Both were 5.7-magnitude quakes. [Updated at 10:30 p.m.] The USGS has a feature on its Web site where you can respond if you felt the quake. Thus far, there are hundreds of responses with people claiming to have experienced the earthquake, representing areas in California and Mexico, to Arizona and Nevada. Some are weighing in with their first brushes with an earthquake; others are posting about some of the quake’s effects, such as people they know getting trapped in elevators. [Updated at 9:40 p.m.] At least one person has been confirmed killed in a building collapse in Mexicali, according to the assistant director of civil protection in Tijuana. There have also been reports of injuries and structural damage, according to Alfredo Escobedo, Mexico's director of civil protection. Pictures from Mexicali showed the sides ripped off buildings, toppled telephone poles, cracked roads, and supermarket aisles strewn with food that had fallen off shelves. In California and Arizona, there were no immediate reports of injuries and only limited reports of damages. Residents across southern California and Arizona reported serious ground shakes. [Updated at 9:33 p.m.] During a press conference earlier this evening, Lucy Jones, a seismologist with the USGS, said some magnitude 5 or magnitude 6 aftershocks were possible during the next few days. [Updated at 8:52 p.m.] There have been three large aftershocks so far, including one that registered a 5.5 magnitude, and other smaller temblors, USGS said. [Updated at 8:47 p.m.] Residents across southern California and Arizona reported serious ground shakes. "We have not felt a shake like that since about 1979," Michelle Tapia told CNN from Brawley, California. Joe Madison was shopping at a department store in Palm Springs, California, when he felt the earthquake. "I felt the entire store move and people went running for the exits," he said. Madison said people gathered outside in the parking lot until the shaking stopped. [Updated at 8:36 p.m.] Here's a bit of background on what earthquake magnitudes mean. According to the USGS, any quake that falls in the range of 7.0 to 7.9 is considered "major." Such quakes occur, on average, 17 to 18 times a year. "All fire stations completed their district drive-through assessment with no significant damage or injuries reported. LAFD had a slight increase in 911 call load mostly associated with automatic alarms and stuck elevators. Again no significant damage or injuries reported." [Updated at 8:10 p.m.] The USGS has these details on the quake and a real-time map of quakes in the U.S. during the past seven days. [Updated at 8:02 p.m.] The magnitude of the earthquake in northwestern Mexico - the epicenter - has been upgraded to 7.2 by the USGS. The quake, which shook the ground at least as far as Los Angeles, California, was originally reported by the USGS to have a 6.9 magnitude. [Posted at 7:23 p.m.] A string of earthquakes rattled the Pacific Coast of the United States and Mexico on Sunday, including a magnitude 6.9 quake that could be felt across Baja California, Arizona and southern California, the U.S. Geological Survey reported. That quake, centered about 110 miles east-southeast of Tijuana, Mexico, was the largest of at least four that struck from the Mexican desert to the northern California wine country, according to the USGS. There was no immediate report of damage or injuries from the quakes in Los Angeles or San Diego, according to authorities in those cities. "We felt it for about 30 seconds. It was rolling," San Diego County Sheriff's Lt. Scott Ybarrondo said. "Nothing fell off the walls here, but we have reports of pictures falling off walls elsewhere in the county." The northernmost quake report came from near Santa Rosa, California, north of San Francisco. That magnitude 4.1 temblor struck about nine minutes after the Baja California quake and about 500 miles further north. Chandeliers swung and water sloshed around in swimming pools in the Los Angeles suburbs, witnesses reported, while posters to the Web site Twitter reported feeling the quake in Phoenix, Arizona. Filed under: Earthquake • U.S.
Hi, I Am In Imperial, Ca. On April 6th At 10:24 Pm, Reading These Blogs & A Big Aftershock Is Shaking My Computer As I Type! The Older I Get The More They Bug Me!